How sad this is and what a stunning reversal and an ominous trend for the U.S.A. Washington D.C. now has the highest median household income. This is a city that produces no wealth, no goods and no innovation. The city only exists to make rules and regulations that destroy and confiscate the wealth of others. If ever there was a clearer signal of how off track the U.S. has become I would be surprised. Labels: U.S. Economy, U.S. 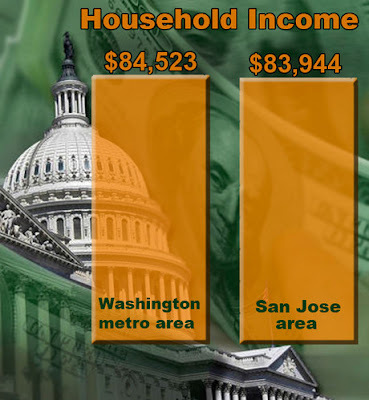 Median Household Income, Washington D.C. I am made to be in full agreement of your sentiments on Washington DC for its low and or no production of wealth, goods and innovations other than policy making, regulations and rules that hurt.